After graduating from CalArts in 1997, former roommates, Mark Chamness and Clay Morrow reunited in Los Angeles to form Gold Cobra just before the close of the millennium. Using a newly built studio as their instrument Gold Cobra began experimenting with electronic fusions of R&B, traditional middle eastern music and Reggae, establishing a globally influenced sonic identity that acknowledged tradition without becoming revivalists. 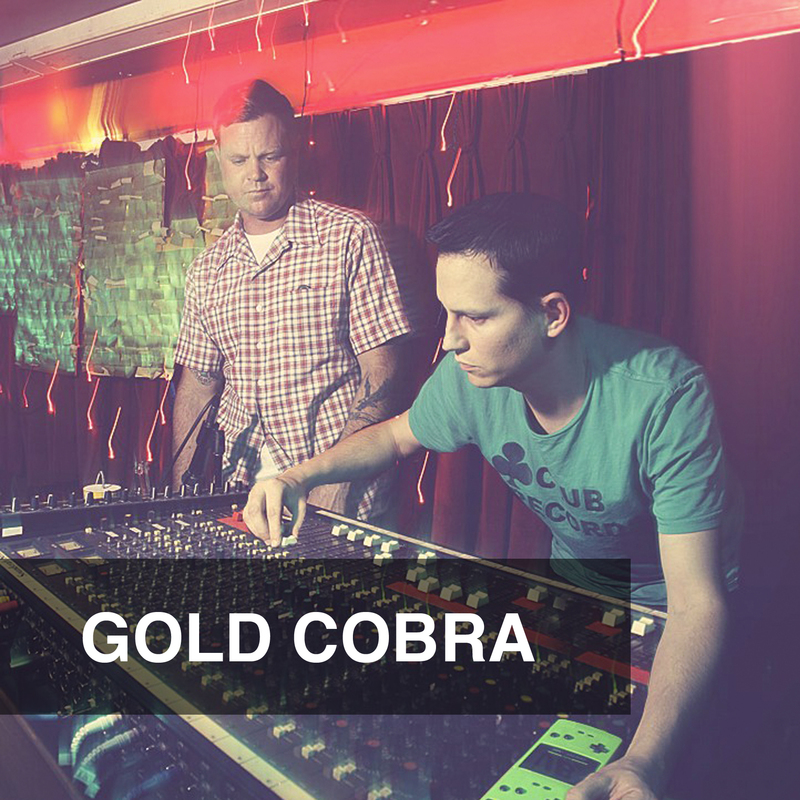 In 2003 Gold Cobra teamed up with friends Dan Boer and Zac Pike (Dynamic Pressure, Sand Dollar Sound, Slow Bullets, The Upbeat) to form Club Records and began releasing split 45’s which featured collaborations with singer Pilar Diaz (Los Abandoned), Dee Jay Coco Thun, saxophonist James King (Fitz and the Tantrums), and Guitarist Zac Pike (Sand Dollar Sound). Then in 2011 Gold Cobra’s 7″ singles’ “Tiger in the Sky” (#6) and “John Wayne” (#18) both made Juno.co.uk’s “Best of Dub” list. And later that year Gold Cobra established the Uni-fi Sound System, a mobile ‘Dub Station’ that allows the duo to deconstruct their songs live via an arsenal of analog effects just as they would do in the studio. And most recently Gold Cobra’s “Friday the 13th Dub” was included on the “Rhygin Showcase” LP, garnering new fans and praise from UK’s The Wire magazine: “Gold Cobra have more of a live approach, remixing tunes on the fly, incorporating spring reverb blasts, echo twists and mixing-desk mutes to create spontaneous dubs.” Gold Cobra are currently working on new material with releases planned for early 2014.